If you’re in the market for a new guitar amplifier, you could be forgiven for being somewhat overwhelmed by the amount of choice available. From budget, low-output practice amplifiers to expensive, esoteric boutique amplifiers, via a vast range of combos and stacks… where do you begin? 2. What types of sound am I after? 3. Where am I going to be playing it? When you start your research into your next amp purchase, you’ll no doubt be faced with the two big choices: combo or stack (amp head and cabinet), and valve or solid state. Let’s look at the first first. Combos are great: you just plug in and play. You can find combos from 1W to 100W or so, but most are around the 15W to 40W range. Amplifier heads are the place to look if you want a lot of choice for big wattages, with a good number of 100W and 200W heads available. A separate head and speaker cabinet gives you the option to add additional heads and cabinets later, so you can mix and match components to expand your range of tones. How about the choice of open or closed-back cabinets, or switching out one speaker of a 2×12 cabinet for a differently voiced speaker giving you an additional choice when you mic up? A separate head and cabinet can sometimes be easier to transport (big ol’ 4x12s notwithstanding… ), but it can be more expensive to buy the head and cabinet separately compared to a combo. When you’re mixing and matching cabinets and heads, make sure you pay attention to the ‘impedance’ ratings and make sure that everything is compatible. As for the good old valves versus solid state debate, that one continues to rage on and on. For those bluesy, on the verge of just breaking up tones, valves probably still have the slight edge; for pure, clean tones, the lack of distortion in solid state amps is difficult to beat; just look at the success and history of the Roland Jazz Chorus: its use by players such as The Edge, Jeff Buckley and Kirk Hammett show that the word ‘Jazz’ doesn’t mean it can’t genre hop. Solid-state amps are also generally lighter and often more reliable: you don’t need to worry about when it’s time to change those tubes! When comparing valve and solid-state amps, bear in mind that, generally, different measures of ‘loudness’ are used between valve and solid-state amps, and valve amps will usually be louder for a given Wattage. Of course, progress being progress, you can now get the best of both worlds. Some amplifiers use so-called ‘hybrid’ designs, usually using valves in the preamp stage and transistors for the power amp so give you that smooth, creamy, warm valve breakup, but in a lighter and cheaper package; more rare are those that use a transistor preamp and a valve in the power amp. The big game-changer that progress and solid-state and digital technology has given us though, is the modelling amp, discussed later on. Basically, how loud do you want to be? If you need to be heard over a drummer, then that little 1W amp, which seemed to scream in the corner of your bedroom, might start to sound a bit more like a whisper. For smallish band gigs, 15W may be quite sufficient from a valve amplifier, with 60W or so being a reasonable equivalent from a solid-state amp. That said of course, the valve/tube amplifiers will start to distort the louder you turn those gain and volume controls so, if you rely on a good clean tone, an amplifier with more power than you might think you need is a worthwhile investment. Of course, for many sought-after tones, it’s just that amplifier break up that’s required. For those situations, look for amplifiers that have separate channel (sometimes labelled as ‘gain’) and master volumes. This will allow you to push the preamp into that nice overdrive, but control the output volume, allowing you to get that crunch without stripping the paint from passing cars. Unfortunately, some of those great tones have come from the power amp stage of the amp starting to distort as well, and the only way to get that is to crank that master knob clockwise. If you predominantly record, or you will be playing with a PA, then the easiest way to get these sorts of tones is with a low-wattage amp. There are a number of amps with power ratings from 1-5 Watts that are ideal for these sorts of situations. There are also a number of amps on the market that allow you to select the power output of the amp by switching different valves in the power amp in and out. If your amp tends to be a ‘set and forget’ piece of gear, and you either stick to the one sound or adjust your tone with your guitars controls and/or pedals, having several channels and a lot of on-board tone-shaping controls might be more than you need. If your amp is how you do the majority of your tone-shaping, however, and you need to quickly change between different sounds, an amplifier with multiple channels that can be selected using a foot switch may be what you’re after. Don’t think that it’s just the amplifier that is going to generate the sound you want, that big round paper thing in the box underneath it makes quite a difference; so does the box in fact… Bigger speakers will carry more weight in the bottom end, but may lose some of their sparkle compared to some of the smaller speakers. That said, once you get beyond practice amp-sized amplifiers, 10″ and 12″ speakers are far and away the most common size of speaker. Companies such as Jenson and Celestion manufacture a range of speakers that are all voiced differently, and changing a speaker or two can get you that one stage closer to the perfect tone you’re after. If you’re using a separate head and cabinet, it’s straightforward just to plug into another cab. If you’re using a combo, you could change your speaker, or buy an extension cabinet and use that instead of the combo’s own speaker. You could also experiment with open and closed-back cabs. If you’re interested in the theory, you can read up on ‘free air resonance’ and how it applies to guitar speakers, but the basic message is that, in a closed-back speaker the cone has to compress the air behind it as it moves, which is a bit harder to do, so you get a ‘tighter’ sound that works well for rock-tones. As with all these things though, everything is interactive, you might prefer one type of cabinet with one guitar and a different type with another. But think of the fun you can have trying out all these combinations! If you’ve plugged into a range of different amplifiers, you’ll know that they sound different -that makes sense- but what if you want the verse of your song to have those classic Fender combo clean sounds, but then have a chorus that sounds like a cranked Marshall stack trying to make itself heard over a Metallica concert going on at the other side of the room? If this is the type of problem you face, then a modelling amplifier may be for you. Using advanced algorithms and clever maths, today’s modelling amps can reproduce all the tones that you could find in the attic of an obsessive vintage amp collector, but in one box that you can actually afford and that you don’t need to be overly brave to take to pub gigs. While some of the models may not be absolutely 100% accurate and faithful to the real thing, they do all generally sound excellent and give you tones that you can use. For a first amp, modelling amplifiers are a great way to go. They are also great to have in the studio and can be a great second or third amp; if you already have an authentic tube amp or two, a modelling amp can fill in all the holes in your guitar sound repertoire. The majority also feature a range of built-in effects, making them even better value for money. 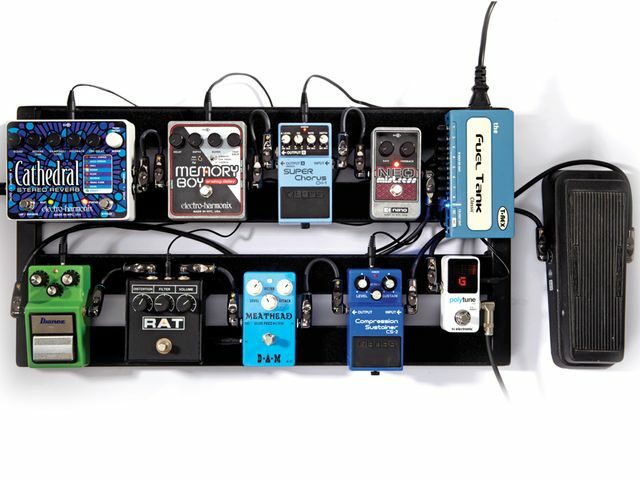 Depending on your style and preferences, you may already have a good selection of pedals to add to your range of tones, but don’t overlook pedals as a way of adding features to an amplifier that is otherwise exactly what you’re looking for. For example, if you’ve identified that perfect vacuum tube overdrive tone, but the amp doesn’t feature built-in reverb, which was on your wishlist, then you can always add a reverb pedal to your setup. Likewise if you require a bit more overdrive than the amp can offer at a respectable volume, this is something else that can be remedied with pedals. If you consider the amplifier as the starting point of your tone, getting the sound right here and adding additional sounds with pedals or outboard might be the way to go. The Boss AD-10 Acoustic Preamp – your DI salvation? Take our test! How much of a guitar geek are you?